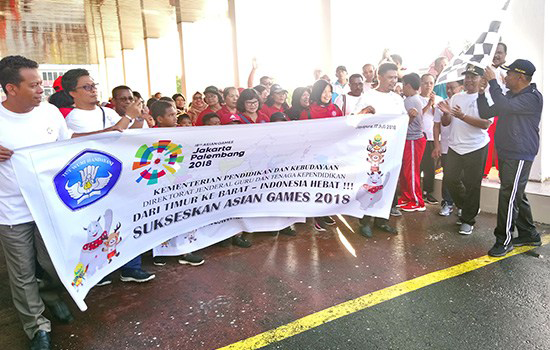 A total of 1500 participants follow a healthy path to succeed the Asian Games 2018 in Jakarta and Palembang. This healthy road is released directly Minister of Education and Culture of the Republic of Indonesia (Mendikbud RI), Muhadjir Effendy. The leisurely road trip themed: "From East to West Indonesia Great Indonesia" is the start of the Office of the Governor of Papua, Ruko Dok II, Taman Imbi, APO and again finish in the Office of the Governor of Papua. "Let's welcome Asean Games to be held in Indonesia. The people of Papua should support the Asian Games, so that Indonesia can enter the top 10, "Muhadjir said in his speech, Tuesday, July 17, 2018. Acting Governor of Papua Soedarmo said, this healthy walking in order to succeed the Asian Games 2018. "This activity has been planned both the committee. I hope it runs smoothly and safely. Let's follow the direction of the committee, "he said.